Ryburn United v Midgley United. Brad Waddington for Ryburn and Callum Rodgers for Midgley. Ryburn United are through to the semi-finals of the West Riding County Challenge Cup after shooting down Robin Hood Athletic 3-2 in Leeds yesterday. The Ripponden side join Boroughbridge, Carlton Athletic and Steeton in the last four. “We will be the team they all want to draw,” said jubilant Ryburn boss Craig Walker. Few Halifax AFL sides make it past the first couple of rounds of the county competition but Ryburn had previously knocked out Rimington, Ilkley Town, Skipton LMS (walkover) and Leeds City Rovers before yesterday. 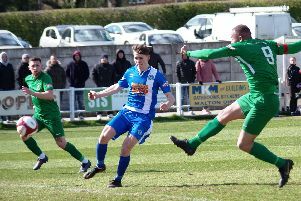 Walker, who is keen to avoid playing West Yorkshire League leaders Carlton Athletic, said opponents had underestimated his side so far but their success had been no fluke. On a huge pitch at Rothwell, Ryburn sat too deep and Robin Hood took the lead after 15 minutes when a cross was flicked on and the ball knocked over ‘keeper Matty Hirst. The visitors started to find their feet and drew level after 25 minutes when, from a set piece, Brad Waddington took the ball past a defender and clipped it into the top corner of the net. Christian Silkstone gave Ryburn a 2-1 interval lead from the penalty spot, after he had been brought down rounding the ‘keeper, and he put more daylight between the teams following Owen Wilkinson’s ball over the defence. Hirst had a dazzling sun to contend with in the second half and when he could only palm the ball away from a free-kick, Robin Hood got one back. Ryburn, who had hit the bar and seen a further effort cleared off the line in the first half, came under heavy late pressure. However, Waddington, Oliver Brearley, Macauley Peacock and Carl Maguire continued to defend superbly and Hirst made an excellent save. Success is coming at a price for Ryburn, however, as they have fallen 14 points behind title rivals Illingworth St Mary’s. The pair have still to meet twice in the league as well as in a Challenge Cup semi-final.